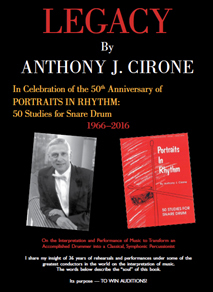 Fifty individual video presentations of the Etudes from Portraits in Rhythm. Performed in a Master Class setting, Cirone provides a detailed analysis of his personal interpretation of the dynamics, phrasing, and articulations in the music. ". . . an illuminating description of the profound, complex, and rewarding creation of musical performances . . ."
". . . (Cirone) has caught the essence, the life, in this unique world of top orchestras." "(Tony) brilliantly takes the audience behind the scenes and describes the complexity of the orchestra's internal dynamics." "This wonderful book, impossible to put down once you start reading it, gives a glimpse of that world (music and passion) few come to know . . ."
"Tony is dead on—an insider who knows the joys and tensions of working in a symphony orchestra." "This witty, informative book answers every question a reader may have about how major orchestras function." The Dictionary includes terms in Italian, French, & German plus German Musical Phrases. There are over 4000 Foreign Terms and 160 Musical Examples with comprehensive sections for Percussion and Strings.